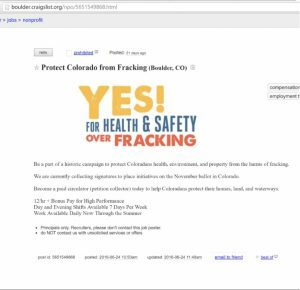 Just when we thought things could not get more bizarre with the anti-science folks in the fractivist movement, we see this…an amateur looking Craigslist ad in Boulder encourages applicants to “be part of a historic campaign” to help “Coloradans protect their homes, land, and waterways.” While it sounds like it might be a pro-fracking ad – yay property rights! It’s not. It’s also not exactly a patriotic call to “Buy War Bonds” or “Man the Guns, Join the Navy,” but let’s be clear, they have a slightly different target audience. The amazing part is that the paid petition circulators are only being offered $12 per hour, while their buddies on the left are running a $15/hour minimum wage initiative. It looks like, for the left, it’s another case of “do as I say, not as I do” governance.